Promise can be found nestled in the crook of rock where the Istrian Peninsula meets the Dalmatian coast. This is Rijeka, a city with a rich cultural history, and one that is also aware of a new rhythm emerging from the possibilities of transition. Today, Rijeka, along with the rest of Croatia and the Balkan region, faces complex challenges in maintaining its strengths and forging a new identity for itself. In 2010, Musagetes convened the Rijeka Café, a conversation and exploration of the city involving local and international artists, cultural thinkers, policy-makers, and practitioners. We asked: What potential does art offer small transitioning cities imagining new futures? Since the 2010 Café, Musagetes, along with many organizations and individuals, has been working with international and local artists to undertake projects in Rijeka that explore this. Laetitia Sonami (Oakland, USA), Matthew Mazzotta (Boston, USA), DodoLab (Hamilton, Canada), Althea Thauberger (Vancouver, Canada), and Nadija Mustapić and Toni Meštrović (Rijeka, Croatia) have all worked within significant spaces in the city: the water break pier, the city hall, the Benčić complex, and the train station to name a few. Their artistic projects explore the political, spatial, and social dynamics of Rijeka, asking questions about renewal, labour, play, adaptation, and the changing identities of the city and its people. After four years of co-creating artistic programming in the community, we came together again from April 25-26 to reflect on what we have learned and to imagine new possibilities for Rijeka’s future. 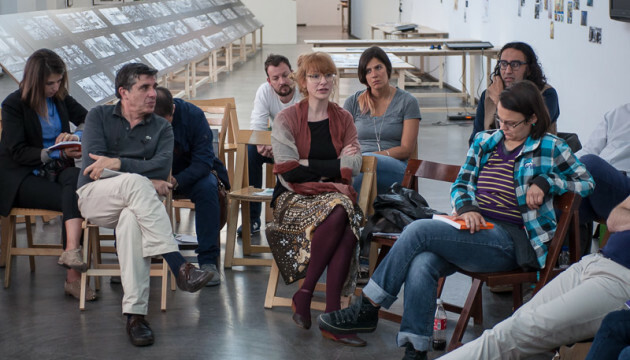 For this reconvening we posed new questions: How do individuals in Rijeka find meaning in art? How are people affected by art—by encountering, participating, and co-creating it? How do architectural experiments and art in public spaces strengthen the promise of a city? What futures do Rijekans imagine for themselves and for the city? Through formal and informal discussion, a film screening, a walking tour, and group readings, we explored the various ways that art and architecture can transform a city. Over the course of the gathering, we heard observations and ideas, continued the dialogue about how the arts can be more central and meaningful in peoples’ lives, in our communities, and in our society.